It is believed that all organisms have evolved from a cell type that appeared about 3500x106 years ago, known as LUCA (Last Universal Common Ancestor). This cell must have been simple and supposedly similar to the current prokaryotes. However, the complexity of some of these early cells increased with time and led to eukaryotic cells. Current eukaryotic cells have internal membrane-bound compartments such as nucleus, organelles like endoplasmic reticulum, Golgi apparatus, endosomes, mitochondria, chloroplasts, as well as cytoskeleton. The oldest fossils of eukaryote cells found suggest that they were already present around 1500x106 years ago, but it is plausible that eukaryote cells appeared much earlier. It is widely accepted that some organelles of eukaryote cells emerged by endosymbiosis. Mereschokovsky (1905, 1910) proposed that chloroplasts are descendants of a prokaryote cell incorporated by a eukaryote cell. He named this process as symbiogenesis, and it later became known as endosymbiosis. Mitochondria and chloroplasts are derived from free ancient prokaryote cells that were incorporated in other cells and evolved into intracellular organelles. Some authors have suggested other cell organelles like peroxisomes, cilia and flagela are also the result of endosymbiosis processes, but there is no experimental support. The endosymbiosis theory is supported by the similarities between the current bacteria and mitochondria and chloroplasts. For example, both have similar sizes than bacteria, circular DNA inside, and 70S ribosomes. Furthermore, both organelles are able of dividing inside the eukaryote cytoplasm. The double membrane of mitochondria and chloroplast does not mean that one is from the ancient bacterium and the other from the host. Actually, in the case of chloroplasts, both membranes are thought to belong to the ancient bacteria, which only lost the peptidoglycan. These two organelles evolved from ancient free bacteria that were incorporated or entered in other larger cells (mitochondria into an archaea and chloroplast into a eukaryote cell). The two cellular types became so dependent between each other that they only could live together. Mitochondria ancestors could be the ancestors of the current alfa-proteobacteria and the ancestors of chloroplasts could be the ancestors of the current cyanobacteria. Figure 1. Schematic representation of the supposed events that originated mitochondria and chloroplasts. Two independent endosymbiotic events would have been occurred. Chloroplasts are thought to have evolved from ancient prokaryotes similar to the current cyanobacteria. The endosymbiosis theory proposes an initial fusion of two prokaryote cells, most probably between a bacterium and an archaea (Figure 1). It likely happened after a long period of metabolic collaboration between both types of cells, so that there was a symbiosis (not endosymbiosis yet) before the fusion. After the fusion, the cell developed a complex system of membranes, cytoskeleton, and the bacterium became the current mitochondria. We already have the eukaryote cell. A second colonization occurred in some eukaryiote cells by bacteria containing chlorophyll pigments, similar to the cyanobacteria, that after a long period of evolution became the current chloroplasts. These cells with two endosymbiosis processes are the photosynthetic cells of plants, algae and unicellular photosynthetic cells. In this way, there have been two successive endosymbiosis, and some authors regard plant cells as well-organized microbial communities. Figure 2. Primary and secondary endosymbiotic events are depicted. Hore complex cellular communities have been observed. A primary endosymbiosis (do not confuse with the first endosymbiosis) results after the association between two free cells, one of them ends inside the other (Figure 2). With the pass of the time, DNA is transferred between the two cells and evolves to keep the endosymbiosis. Three primary endosymbiosis are known. Mitochondria and chloroplasts are the result of the two more widely distributed primary endosymbiosis. They also had a deep impact in the cell lineages evolution. There is a third primary endosymbiosis of an alpha-cynabacteria and the eukaryote Paulinella chromatophora. In the three cases, The incorporated cells transferred or lost genes, but kept some of them needed, for example, for division and DNA processing. 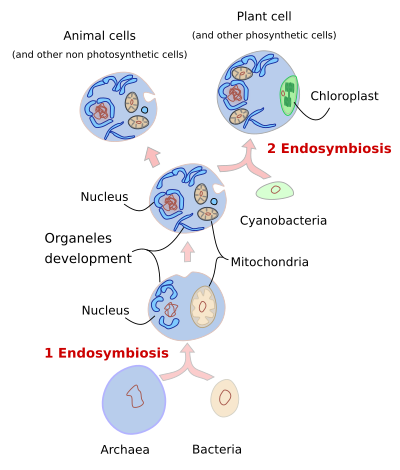 A secondary endosymbiosis (do not confuse with the second endosymbiosis) happened when a cell with mitochondria and chloroplasts engulfed another cell that also contained mitochondria and chloroplasts (Figure 2). The engulfed cell became endosymbiont, lost its nucleus or got atrophied, and their chloroplasts started to work for and relied on the host cell. Three independent events of secondary endosymbiosis are currently known. 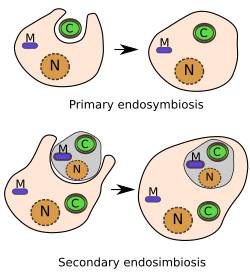 Tertiary endosymbiosis happened when a eukaryote cell incorporated another eukaryote that was the result of a previous secondary endosymbiosis. There are living examples in nature of all these types of endosymbiosis. It should be noted, however, that current mitochondria and chloroplasts are quite different from current aerobic bacteria and cyanobacteria, respectively. For example, current cyanobacteria contain about 3000 genes, whereas chloroplasts only have around 100 to 200 genes. The genes that remained in the chloroplast are responsible for around 10 % of its proteins. This is because many genes were trasnferred from chloroplast to the host cell nucleus, which now synthesizes many proteins needed by chloroplasts. It is a very complex mechanism since the transferred genes must work in a completely different environment and their products have to travel, enter, and carry out their functions in different compartments inside the endosymbiont. However, it is advantageous for the host cell because it takes the control over the functions and proliferation of chloroplasts. A similar process have happened to mitochondria. Nowadays, there are many examples of are responsible for around 10 % of its proteins. This is because many bacteria, but none of archaea, living inside eukaryote cells like endosymbionts, even bacteria inside archaeas. However, none of them show the deep integration of mitochondria and chloroplasts. All of them are different ways of cooperation between different types of cells explored by evolution. Whatever the relationship, the endosymbiont provides molecules needed by the host. In many are responsible for around 10 % of its proteins. This is because many invertebrates, there are bacteria that can complete their life cycle inside the animal cells, and can even be transmitted to the offspring included in gametes. They are so well adapted that are harmless to the host, being sometimes advantageous or even essential. Actually, it is like an infection without collateral damages, even although they use the same molecular network as pathogen bacteria for proliferation. There are some examples of endosymbiosis involving two eukaryotes as well. For example, a paramecium (Bursaria) containing algae (Chlorella). Propelled by cilia, the paramecium always moves to illuminated places where algae take advantage of the higher intensity of light to photosynthesize organic molecules that are used by the paramecium. There are many more examples. Some secondary symbionts are not permanent and can invade horizontally, that is they can jump to a different host. In this case, their DNA is not as large as in free bacteria and not as small as in other better integrated endosymbionts. Dacks JB, Field MC. Evolution of the eukaryotic membrane-trafficking system: origin, tempo and mode. 2007. Journal of cell science. 120:2977-2985.
de Duve C. El origen de las células eucariotas. 1996. Investigación y Ciencia. Junio:18-26. McFadden GI. Chloroplast origin and integration. 2001. Plant Physiol. 125:50-53. Poole AM, Penny D. Evaluating hypotheses for the origin of eukaryotes. 2006. BioEssays. 29:74-84. Simpson AGB, Roger AJ. Eucaryotic evolution. Getting to the root of the problem. 2002. Curr Biol. 12:R691-R693.